Eskom Board chairperson, Jabu Mabuza says former Eskom Executive Matshela Koko shared classified information which led to the appointment of McKinsey for the top engineers programme. He is appearing before the State Capture Inquiry underway in Parktown, Johannesburg. Mabuza says the Board has challenged the validity of the contract in the High Court as it did not meet the necessary procurement requirements. Mabuza says the top engineers programme was a strategic plan by Eskom’s former executives to permanently appoint and retain engineers in the wake of loadshedding incidents. 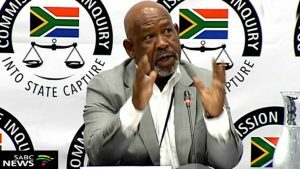 The Eskom Chair further argues that there were emails sent by Koko to a person, he believes is Salim Essa – a businessman known for his links to the Gupta family – about business opportunities at Eskom. During his appearance last week, Mabuza said Eskom was the main theatre for corruption and state capture when he arrived at the utility last year. The post Koko shared classified Eskom information with external parties: Mabuza appeared first on SABC News – Breaking news, special reports, world, business, sport coverage of all South African current events. Africa's news leader..